We spoke to a Radiologist who says when he was in medical school 12 years ago, doctors could only evaluate if a patient had a stroke by looking at them. Times have changed. CHI St. Alexius in Bismarck just became the first hospital in North Dakota to bring in RAPID stroke imaging software. Doctor Nicholas Bradbury says this is revolutionary because when someone has a stroke, every minute counts and this will allow doctors to detect a stroke immediately. It's also more accurate. 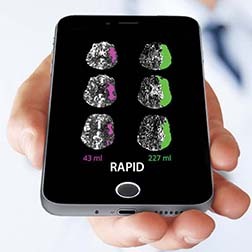 RAPID can tell a doctor instantly what percentage of brain tissue is still salvageable, so they can decide with confidence whether it's worth treating. The Interventional Radiologist explains, "There's not time in this process to wait for an extra hour for something to be done, so it's instantly processed and it's information that's given to us instantly that we can use to help make our decision, in that moment when time is crucial." Dr. Bradbury says the speed of this new technology is especially important in western North Dakota because patients often travel hours to get to hospitals.